Hurry! Hurry! Step right up, folks! See Jo-Jo the Dog-Faced Boy, the Wild Man of Borneo, the Fire-Breathing Man, and that's just for starters! 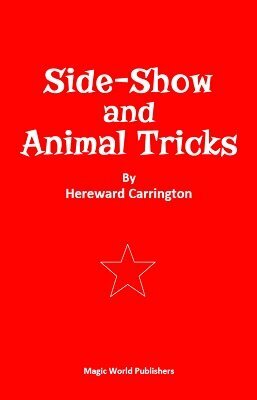 Learn the inner secrets of the sideshow including fire walking, animal training, ventriloquism, juggling, geek stunts, special stage effects, and even the inside secrets of the professional card sharp. Teach your dog to be a "magician!" Several effects and methods are described. Amaze your friends by carrying on a conversation with your "talking cat!" When you learn how easy it is to "throw your voice," you'll have more fun than a person has a right to! We spared no expense to update this classic behind-the-scenes look at the carnival sideshow by spending considerable time researching and obtaining copyright clearance to add more photos and drawings. We completely reset the type to make it easier to read. We redistributed the original diagrams so they now align with the text to save flipping back and forth. This is a fun, factual account of the unusual life on the midway.